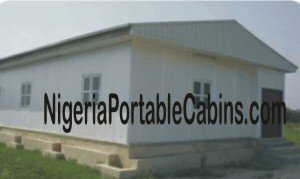 We offer prefab building construction services to customers all over Nigeria. This means that you don't have to worry about house construction headaches especially when you plan to build a house in Nigeria and you live overseas or you plan to build a house in your village but live in any of the cities in Nigeria like Lagos, Abuja, Ibadan, Port Harcourt . . . or any of the other big cities in Nigeria. We offer a fast, reliable, and trustworthy prefab building construction service. We offer two types of prefab house construction . . . factory construction and onsite construction. Factory Construction Option means that we build the prefab building at our factory and then transport the building to customers wherever they need them in Nigeria. When you order a factory constructed building, you pay for the shipping cost . . . the cost of transporting the building to you or to wherever you want it delivered. Prefab building transportation cost is a function of the size of the building and the destination where the building is to be delivered. building whose destination is Abuja. Onsite construction, on the other hand, means that the house construction takes place at the customer site . . . the site where the building is required. This means that we transport all the building materials . . . the prefabricated sandwich panels, steel materials, and accessories . . . as well as the equipment required for the construction and the construction team to the customer's site. This means that the home construction takes place right before the eyes of the customer. How do you order onsite prefab building construction? You can order onsite construction by specifying that you want the building constructed at your site and NOT in our factory when you request a quote. Factory house construction applies only to buildings that have a maximum size of 12 metres by 3.45 metres (or 40 feet by 11 feet). If you plan to build a house bigger than 12 metres by 3.45 metres, the building will automatically be built onsite. If you also plan to build a prefab duplex, the house construction will also take place onsite. That is, at your premises or at the location where the building is required. We do not transport prefab duplex. Need a professional and reliable prefab home construction company? Want fast delivery . . . on-time and in-full?